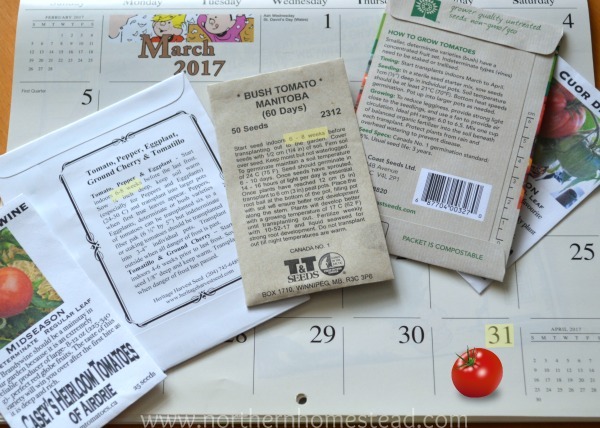 There is a very simple answer to the question ‘When to Start Tomatoes Indoors’: it’s written on the seed package. 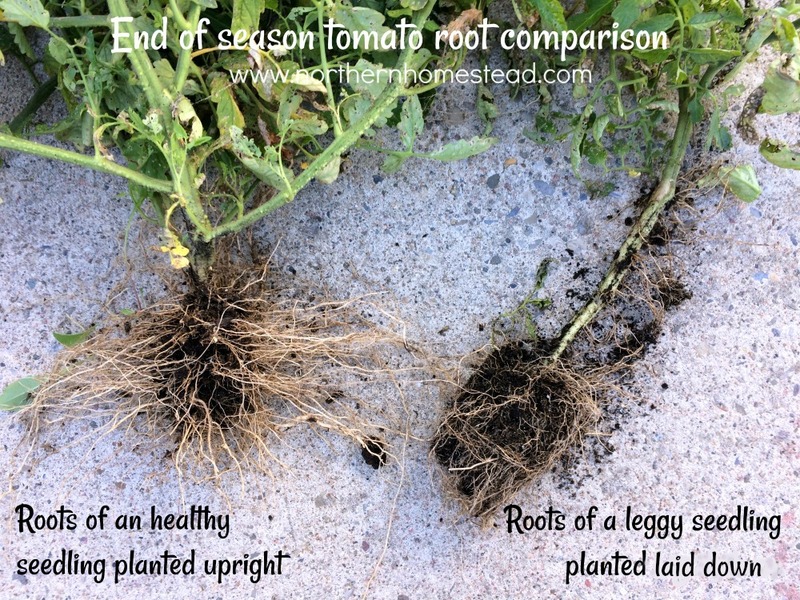 For most tomatoes it is 6 to 8 weeks before the last frost day. To find your last frost date, go to these links if you live in Canada or in the USA. Our last frost day is May 26, counting back 8 weeks we come to March 31. 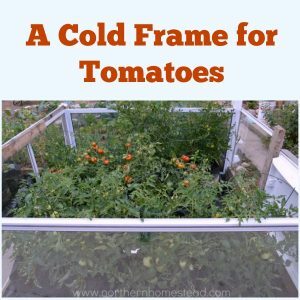 If you have a greenhouse you can plant the tomatoes out about two weeks before the last frost day, so start them two weeks earlier. This is basically all you need to know. However, there is more to that question. 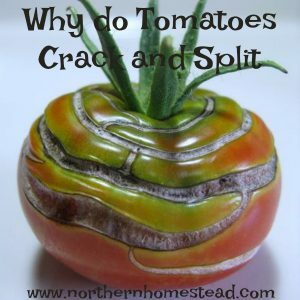 When we first started growing tomatoes it was very confusing to me. Already in February, or at the latest at the beginning of March, everyone seemed to be eager to start seeds indoor. It even made me wonder if the seed packages had wrong dates on them. I started making my own experiences and learning from them. Every year I would start a little later just to find that it actually was much better. At the end we had healthier seedlings and better, earlier harvests. 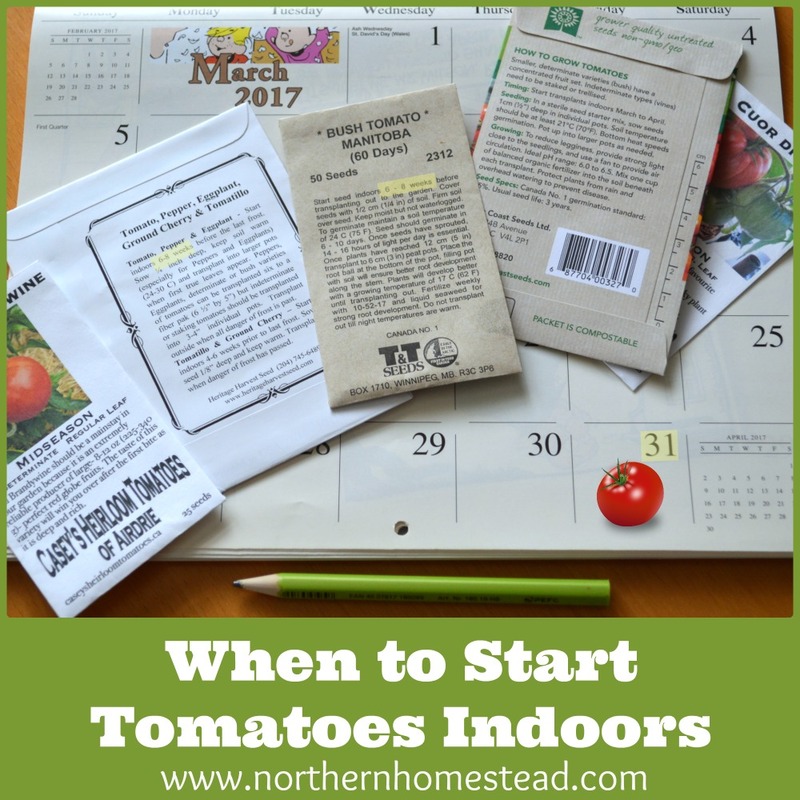 Even though a lot of gardeners still like to start very early, starting seeds indoors 3 to 4 months before the last frost day in most cases does not result in earlier and healthier tomatoes. Why is that? Let’s take a closer look. In our area the daylight from October 28 to February 14 is less then 10 hours. Often the much needed winter sun is obstructed by neighbouring buildings and trees. Growing year round we can really see the impact the “below 10 hour days” have. Calculate your garden’s “below 10 hour days”. If you start your seeds right at the edge of the 10 hour day, they will grow very slow and become spindly. Spindly and weak seedlings for the most part are no good. They do recover after being planted, but that takes time, precious time that a short growing season gardener does not have. And there is only one tomato variety that might have some profit from it, see below. To avoid having spindly seedlings you can use a grow light, but then your seedlings will grow fast and result in overgrown plants, which leads to a different problem. The focus of every plant is to bring forth seeds. 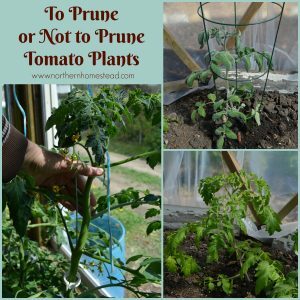 If the plant is healthy and the growing conditions are right, the plant will concentrate on getting a good root system, leaves, flowers, and then fruit – and lots of it. However, if a seedling sits for too long in a too small pot, it gives the plant the signal that it can’t get any better roots nor leaves. All it wants to do now is to produce some fruit before it perishes. 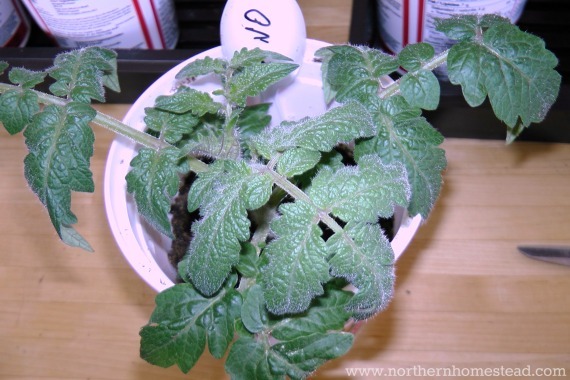 As a beginner gardener you might be exited to see the first flowers and even fruit on your seedling, thinking that you really got a head start. But that is not true. What you got is a desperate plant that has put all its energy into producing that first fruit. It will not have the energy to produce more than that, and often that first fruit does not mature properly. Taking off the first flowers does help, but then you have lost the first fruit. We are blessed with an unbelievable amount of different tomato varieties to grow in our gardens. We have early and late, small and tall, determinate and indeterminate varieties. Here is a picture comparison of a Tiny Tim and a Sweet Million plant. Even though they are both early varieties and have a similar fruit size and days to maturity time, they will grow very different. The Tiny Tim plant is tiny and will only be a foot tall, the Sweet Million on the other hand can grow to 6 feet. These seedlings are just a few days old, but you can already see a significant size difference. These are two very different plants. Dwarf varieties (determinate and indeterminate), tumbler type, and determinate tomatoes are all bush tomatoes. 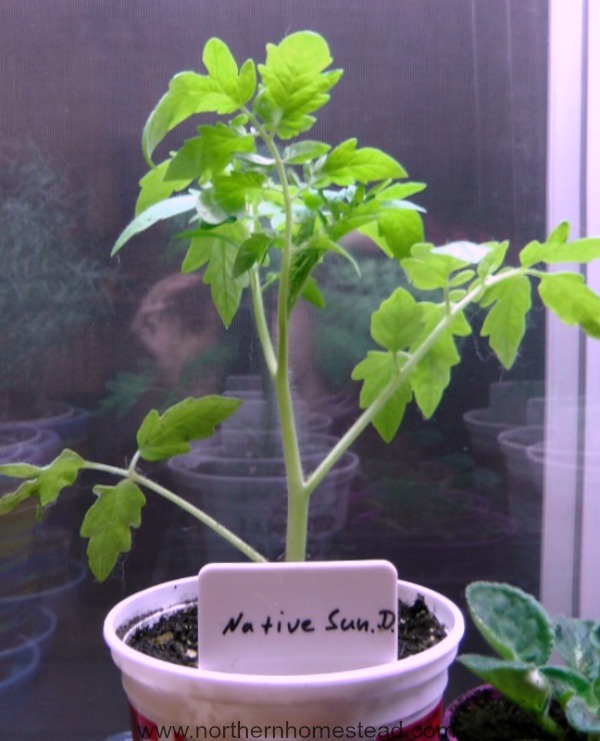 A real determinate tomato will produce all the fruit at one time. Those are good for canning and preserving. Many of these type of tomatoes are also very early. You sure do not want to plant them too early. 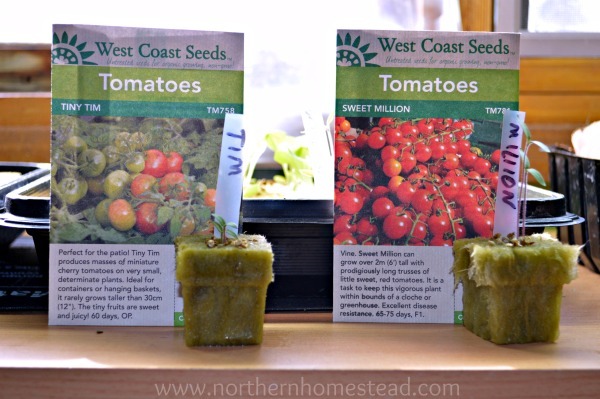 Start them 8 weeks before planting them out, at the earliest. If you are not sure about the weather, start at 6 weeks; in this case if you have to wait longer, the seedling will not overgrow. 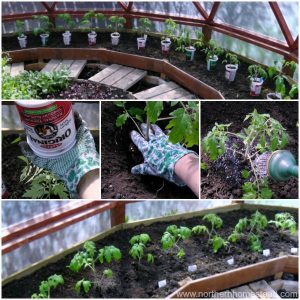 TIP: Tumbler and dwarf plants can be started earlier and transplanted into a bigger and final container long before the weather outside is nice. 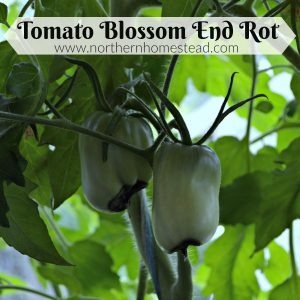 They can be grown indoors for part of their life, or the whole time because they are great for container gardening. This way you can really have some early fruit. 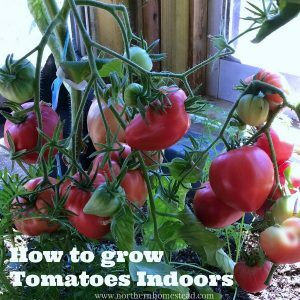 Read more on how to grow tomatoes indoors here. 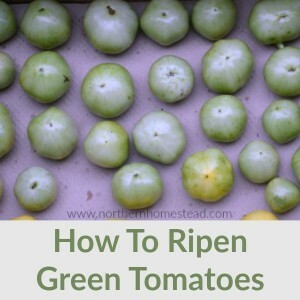 If you search for information about growing tomatoes on the internet, most info you will find is about vine type, indeterminate mid to late season varieties. 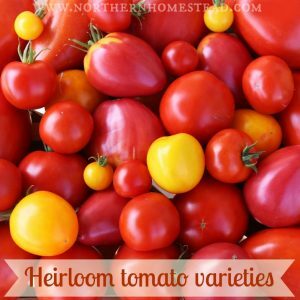 Those are simply the most common tomato varieties to grow all across the world. 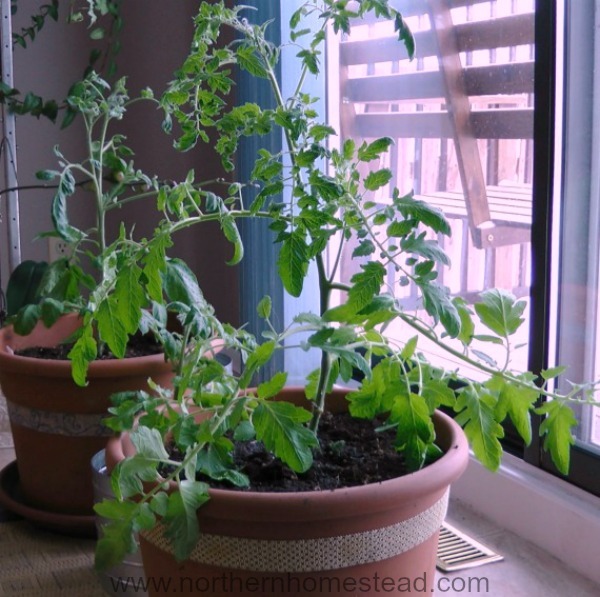 Those are tomato plants that will grow into a tall plant, and keep producing an abundance of fruit for many months. 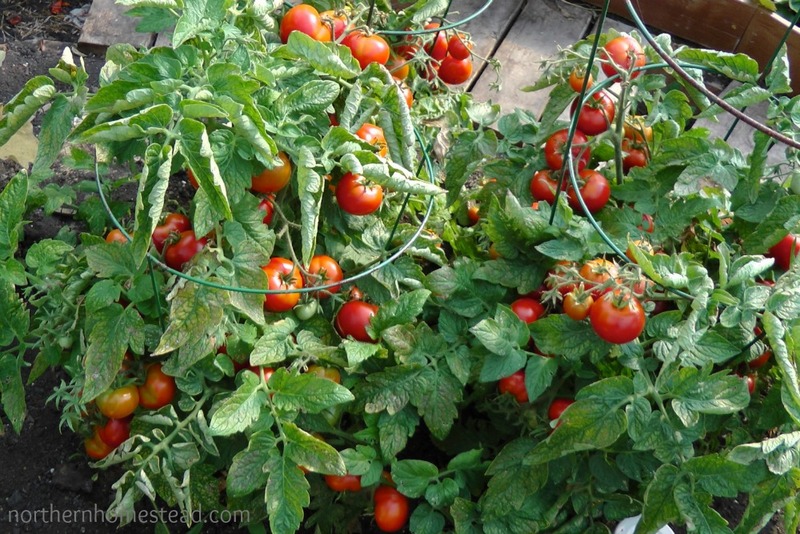 In fact, indeterminate tomatoes are actually perennials, if given the right conditions they can grow into a tomato tree. The indeterminate tomato plants are the only tomato plants that are maybe worth starting very early. 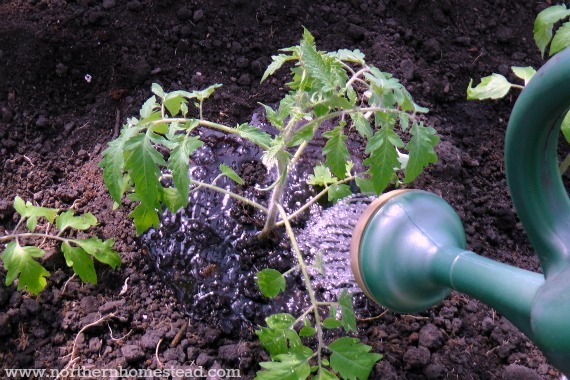 Some tomato growers like to get the seedling up to 2 feet tall, then clip off all the branches except for the top 4-6 inches and bury all of it in a trench, bending the top up carefully. 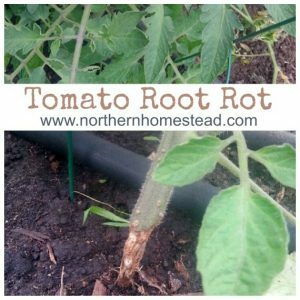 This way the entire stem will become roots, resulting in longer and more roots. I tried both, and here is an end of season comparison. You see how healthy the roots are that were planted as an young seedling, and on the other hand the laid down planted plant has grown some roots, but all of them are smaller. So at least for a short growing season it is not worth it. Start your seedlings later and have healthier plants! Personally I like to have my seedlings at a stage where they are almost putting forth buds, even if growing indeterminate varieties. I also like to plant them vertically, not horizontally, to encourage the roots to reach down to find moisture. This way we do not have to start them earlier and we do not have to water the plants as much during the whole growing season. A win/win. And we harvest lots of tomatoes, even in our short growing season. I hope this helps you to understand tomato starting time a little bit better. 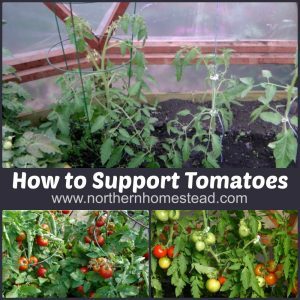 When is your preferred time to start tomatoes? 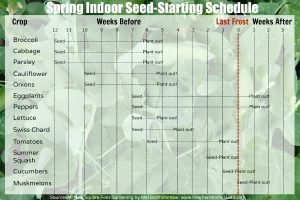 For a free printable schedule for starting seeds indoors go here.